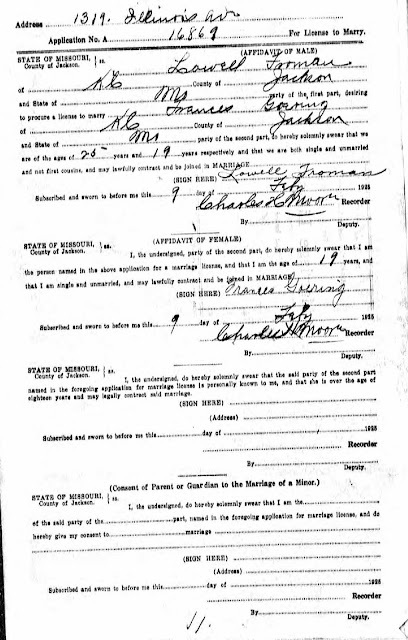 DearMYRTLE's Genealogy Blog: When were Frances Irene Goering and Lowell S. Froman married? When were Frances Irene Goering and Lowell S. Froman married? At 15 years of age, I practiced calligraphy and created a bit of a family chart taking everything my mother wrote on a family group sheet as "gospel truth." After all, mother was the family genealogist, and most certainly asked her own mother about the date of her marriage. So I dipped my C-2 pen into my inkwell, and crafted 25 February 1924 with no thought about the locality or looking for the marriage certificate. After all, who was I to question my grandmother about her painful first marriage? Notice there was also no citation. I merely now recall it was copied from my mother's family group sheets. IMAGE: Reproduction. Original artist's rendering is lost. Shortly after my grandmother's death, my step-grandfather Mike A. McDonnell sent me Frances' parent's family Bible. On the "Marriages" page, we find no mention of the Froman-Goering marriage. However, we can infer that Frances Goering was single as late as 22 July 1923 since she is listed as having stood as a witness to her father Chas. H. Goering's marriage to Elizabeth B. Griffith, Frances' step-mother. IMAGE: Charles Henry Goering Family Bible Records; 1808-1931. The Holy Bible, (unknown publication place or date) privately held by Patricia (Player) Richley, [address for private use], South Jordan Utah, 2015. Charles Henry Goering Family Bible Records; 1808-1931. The Holy Bible, (unknown publication place or date) privately held by Patricia (Player) Richley, [address for private use], South Jordan Utah, 2015. "Frances Irene Goering left her father's house in Emporia, Kansas at midnight January 2nd 1924 without a single Farewell greeting." Was this an elopement leading to the undocumented marriage date of 25 Feb 1924? Along came the 1930 US federal population census where head of household Lowell Froman, wife Frances I and daughter Barbara J. [my mother age 1 and 6/12 months] are enumerated in Wenatchee Precinct K, Chelan, Washington, sheet 15A, stamped 103, lines 6, 7 and 8 below. NOTE: This image is from the NARA microfilm, a slightly better copy from the Ancestry.com image where the couple was located via an index search. Since this is 1930, and it would appear they had first married five years earlier, say 1925, theoretically to each other. This led me to believe a marriage date after 2 Jan 1924 (when she left her father's house) and prior to 17 April 1925 (five years before the 1930 census enumeration) is a possibility. In vain, I scoured Chelan County, Washington marriage records. I searched my grandmother's last home town of Emporia, Lyons County, Kansas with similar disappointing results. At that point, I only knew Lowell was born "in Kansas." I wasn't aware of a Gretna Green for this young couple. Ancestry.com blessed me again with a Missouri Marriage Record (actually a license to marry), narrowing my search even more. The couple applied for the license 9 February 1925. This meant my mother's notation of her parent's marriage on 25 February 1924 was incorrect. The implication is that my grandmother lied to her daughter, perhaps in an attempt to hide that she had lived away from home, possibly with Lowell for over a year before they applied for the license. Maybe my grandmother had only run away for a short time. and it was not noted in the family bible when she returned. We shall never know. Online publication - Provo, UT, USA: The Generations Network, Inc., 2007 [now Ancestry.com] citing original data, Missouri Marriage Records. Jefferson City, MO, USA. (http://www.ancestry.com : accessed 22 Aug 2015). Did the couple marry shortly after 9 Feb 1925 or was there a required waiting period? Certainly the 1925 year of marriage is looking a lot more likely. This research would have to wait until the next road trip to Missouri. During a hangout in August 2015, one of our regulars, Lacey Frazier, noted the problem with my citing only the license. She's an experienced Jackson County, Missouri records researcher, and deftly located the Froman/Goering marriage license and return, providing the image below. 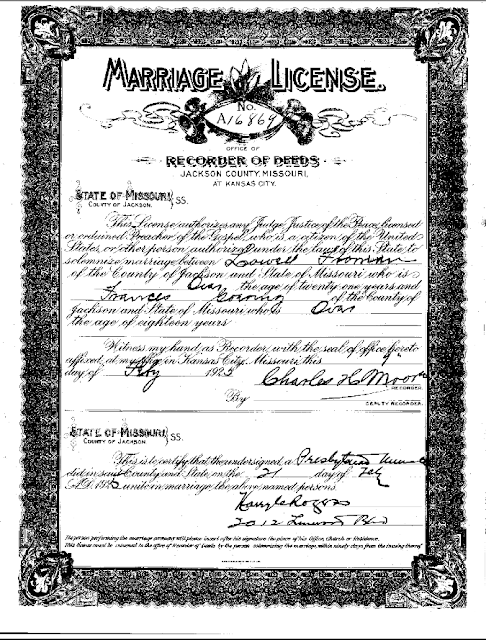 IMAGE: Jackson County, Missouri, Marriage License A16869 [top], Froman-Goering, 1925; Recorder of Deeds, Kansas City and Jackson County, Missouri, Minister's Return, A16869 [bottom], 1925; Recorder of Deeds, Kansas City: digital image (http://records.jacksongov.org : accessed 25 Aug 2015). Jackson County, Missouri, Marriage License A16869 [top], and Minister's Return [bottom] Froman-Goering, 1925; Recorder of Deeds, Kansas City and Jackson County, Missouri: digital image (http://records.jacksongov.org : accessed 25 Aug 2015). Please note the top portion of the Kansas City, Jackson County Missouri Recorder of Deeds form is the 9 Feb 1925 "marriage license" #A16869 for Lowell Froman, over the age of 21 and Frances Goering, over the age of 18. The bottom portion of the form includes the "marriage return" where Harry C. Rogers, a Presbyterian Minister, indicates on the 21 day of Feb 1925 he united the couple in marriage. As my research progressed, I learned to seek original documents created for the marriage of my maternal grandmother. My citations have improved. However, I've now seen where my grandmother had the habit of incorrectly stating dates of not only her birth but also her marriage.